The president of the United States on Monday attacked a Virginia restaurant that refused to serve his press secretary, calling it dirty and in need of a paint job. “I always had a rule: If a restaurant is dirty on the outside, it is dirty on the inside!” Trump tweeted from his government account, citing the Red Hen’s “filthy canopies, doors, and windows.” On Friday the Lexington eatery's owner declined to serve Sarah Huckabee Sanders over her defending an administration that has supported anti-LGBTQ policies. In 1988, Trump was fined $300 by the City of New York for a sidewalk shed outside Trump Tower that was not up to code. In 2003, the Trump organization was cited by the New York City Department of Buildings for failure to maintain an elevator. In 2004, Trump Palace was fined $105 by the City of New York for possessing unregistered fuel burning equipment. According to city data, Trump has not yet paid this ticket. In 2009, the Trump Organization was fined $500 by the New York City Department of Buildings for failing to maintain Trump Tower to code. In 2010, the Trump Organization was fined $250 by the New York City Department of Buildings for failing to maintain Trump Tower to code. In 2011, the Trump Organization was fined $250 by the New York City Department of Buildings for failing to maintain Trump Tower to code. In 2012, Trump’s Trump International Hotel and Tower in Chicago was fined $46,000 by the EPA for environmental damage. In 2013, Trump Soho was fined $3,950 by the City of New York for failing to submit four annual tests for backflow preventers — a violation of New York’s water code. With interest, Trump now owes the city $5,389.05 in unpaid fines on this violation. In 2014, Trump Cafe and Grill in Trump Tower was cited for 9 health violations — 6 of them deemed “critical” — including filth flies, dirty food-contact surfaces, and cold food stored at an improper temperature. In 2014, Trump Bar in Trump Tower was cited for 4 health violations — 3 of them deemed “critical” — for adulterated food, dirty food contact surfaces and cold food stored at an improper temperature. In 2015, Trump Cafe and Grill in Trump Tower was cited for 9 health violations — 6 of them deemed “critical” — including dirty food-contact surfaces, dirty wiping cloths, and cold food stored at an improper temperature. In 2015, Trump Bar in Trump Tower was cited for 2 health violations — 1 of them deemed “critical” — for dirty food contact surfaces. In 2015, the kitchen at Trump Soho was cited for 2 health violations — one of them deemed “critical” — for improperly stored sanitized equipment. In 2015, the Trump Golf Links at Ferry Point was cited for 8 health violations — 4 of them deemed “critical” — including filth flies. In 2016, Trump criticized the Colorado Springs Fire Department for enforcing the fire code at one of his campaign rallies. In 2016, Trump Winery was fined $250 by Arizona officials for failing to comply with the state’s shipping regulations. In 2016, Trump Cafe and Grill in Trump Tower was cited for 5 health violations — three of them deemed “critical” — including live roaches and cold food stored at an improper temperature. In 2016, Trump Bar in Trump Tower was cited for 2 health violations — 1 of them deemed “critical” — for dirty food-contact surfaces. In 2016, the kitchen at Trump Soho was cited for 2 “non-critical” health violations. In 2017, Trump’s restaurant at Mar-a-Lago was cited for 13 health violations, including undercooked fish and hot raw meat — just days before Japanese Prime Minister Shinzo Abe had dinner there. The inspection brought the clubhouse to a combined 78 health violations in just 3 years. In 2017, Trump Cafe and Grill in Trump Tower was cited for 6 health violations — 2 of them deemed “critical” — for the presence of filth flies and hot food stored at an improper temperature. In 2017, Trump Bar in Trump Tower was cited for 3 health violations — 1 of them deemed “critical” — for the presence of filth flies. In 2017, the kitchen at Trump Soho was cited for 3 health violations — 1 of them deemed “critical” — for the presence of mice. In 2017, the Trump Golf Links at Ferry Point were cited for 4 health violations — 3 of them critical — including the lack of a food protection certificate. The Red Hen in Lexington was last inspected in February, according to Virginia Department of Health records, and passed with no violations. Trump's tweet caused major headaches for Red Hen restaurants all over the country because he didn't say which one he was referring to. 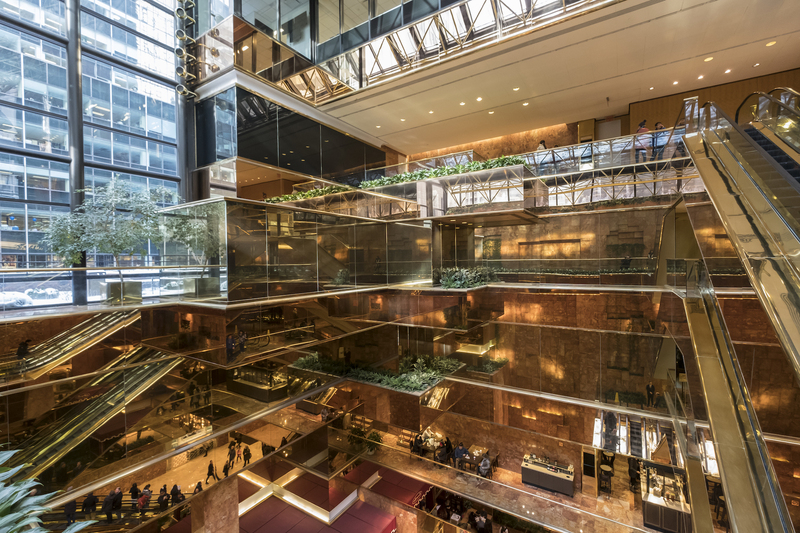 In 1988, Trump was fined $300 by the City of New York for a sidewalk shed outside Trump Tower that was not up to code.In 2003, the Trump organization was cited by the New York City Department of Buildings for failure to maintain an elevator.In 2004, Trump Palace was fined $105 by the City of New York for possessing unregistered fuel burning equipment. According to city data, Trump has not yet paid this ticket.In 2009, the Trump Organization was fined $500 by the New York City Department of Buildings for failing to maintain Trump Tower to code.In 2010, the Trump Organization was fined $250 by the New York City Department of Buildings for failing to maintain Trump Tower to code.In 2011, the Trump Organization was fined $250 by the New York City Department of Buildings for failing to maintain Trump Tower to code.In 2012, Trump’s Trump International Hotel and Tower in Chicago was fined $46,000 by the EPA for environmental damage.In 2013, Trump Soho was fined $3,950 by the City of New York for failing to submit four annual tests for backflow preventers — a violation of New York’s water code. With interest, Trump now owes the city $5,389.05 in unpaid fines on this violation.In 2014, Trump Cafe and Grill in Trump Tower was cited for 9 health violations — 6 of them deemed “critical” — including filth flies, dirty food-contact surfaces, and cold food stored at an improper temperature.In 2014, Trump Bar in Trump Tower was cited for 4 health violations — 3 of them deemed “critical” — for adulterated food, dirty food contact surfaces and cold food stored at an improper temperature.In 2015, Trump Park Avenue was fined $125 by the City of New York for failing to prevent unnecessary fire alarms — a violation of New York’s fire code. Trump has not paid the ticket, and with interest he currently owes the city $144.29In 2015, Trump Cafe and Grill in Trump Tower was cited for 9 health violations — 6 of them deemed “critical” — including dirty food-contact surfaces, dirty wiping cloths, and cold food stored at an improper temperature.In 2015, Trump Bar in Trump Tower was cited for 2 health violations — 1 of them deemed “critical” — for dirty food contact surfaces.In 2015, the kitchen at Trump Soho was cited for 2 health violations — one of them deemed “critical” — for improperly stored sanitized equipment.In 2015, the Trump Golf Links at Ferry Point was cited for 8 health violations — 4 of them deemed “critical” — including filth flies.In 2016, Trump criticized the Colorado Springs Fire Department for enforcing the fire code at one of his campaign rallies.In 2016, Trump Winery was fined $250 by Arizona officials for failing to comply with the state’s shipping regulations.In 2016, Trump Cafe and Grill in Trump Tower was cited for 5 health violations — three of them deemed “critical” — including live roaches and cold food stored at an improper temperature.NYC's skyscraper Trump Tower, on Fifth Avenue, is home for The Trump Organization, Trump Grill restaurant, Trump Bar, Trump Store, and Trump Cafe, February 10th, 2017. Photo/Vladimir Houdek (CTK via AP Images)In 2016, Trump Bar in Trump Tower was cited for 2 health violations — 1 of them deemed “critical” — for dirty food-contact surfaces.In 2016, the kitchen at Trump Soho was cited for 2 “non-critical” health violations.In 2016, the Trump Golf Links at Ferry Point was cited for 2 health violations, 1 of them deemed “critical.”In 2017, Trump’s restaurant at Mar-a-Lago was cited for 13 health violations, including undercooked fish and hot raw meat — just days before Japanese Prime Minister Shinzo Abe had dinner there. The inspection brought the clubhouse to a combined 78 health violations in just 3 years.In 2017, Trump Cafe and Grill in Trump Tower was cited for 6 health violations — 2 of them deemed “critical” — for the presence of filth flies and hot food stored at an improper temperature.In 2017, Trump Bar in Trump Tower was cited for 3 health violations — 1 of them deemed “critical” — for the presence of filth flies.In 2017, the kitchen at Trump Soho was cited for 3 health violations — 1 of them deemed “critical” — for the presence of mice.In 2017, the Trump Golf Links at Ferry Point were cited for 4 health violations — 3 of them critical — including the lack of a food protection certificate.